Normally by mid-December I have at least started thinking about what has happened during the year. 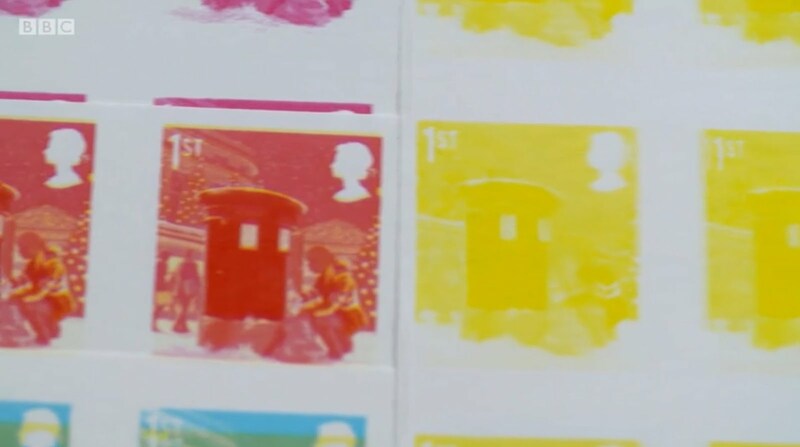 Usually by December all new Machins that there will be have come and gone, and there are no stamps except from PSBs (Star Wars in 2016 and Harry Potter this year). It has been a time to start relaxing, or at least diverting attention to family matters. This year, with Christmas Day falling in the middle of a week, we are away from Saturday to Saturday, so hastening the shut down; I need to post this review earlier than usual. As I said to the members at our philatelic society on Tuesday last, I haven't yet started their latest newsletter, and I blame Royal Mail. If they had not switched the printing of counter sheets to ISP/Walsall – and of course if Walsall had just used one type of ink – the last couple of months of 2018 would have been much the same as any other year - light on news. But more of that later. We don't stock these but record them only, using the information provided by Royal Mail. There were some good opportunities to create maximum cards, the owls being very popular with thematic collectors in Europe. The Royal Air Force centenary issue included values which would only be valid for 8 days before postage rates changed, which provided a challenging exercise to get examples of all of them used to one of the right destinations in the right time. (We have some of these spare, so email if you are interested in this aspect of modern postal history.) For the first time (if we ignore Royal Mail's 500 celebrations in 2016 and the Machin anniversary in 2017) a special stamp issue included a set of Post and Go stamps (Game of Thrones in January). Royal Mail's embargo policy once again meant that some features of some new issues were hidden from the philatelic world: collectors could often see designs at their Post Offices before they were publicised in Royal Mail's Philatelic Bulletin. We were even asked to remove from the blog photographs of embargoed issues that were on show in Post Offices! I've stopped fighting this now. Various things have meant that we had no time to add some to the blog later in the year, from where they are still absent. I'll try to catch up in 2019 - you've already been able to see the first 2019 issue here. 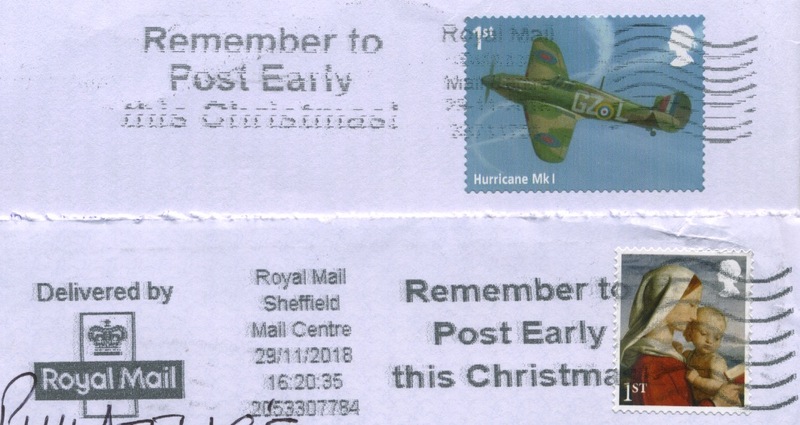 Due to a communications error, this year's 1st and 2nd class Christmas stamps were printed in two designs on one sheet (as last year) as well as in complete sheets of the Postbox designs. These could be bought from some Post Offices or in complete sheets from Royal Mail. The company's lack of control over Post Office Ltd continued, with early releases of the Old Vic, World War I, and Christmas stamps reported. In June, RM announced the suspension of the Smilers personalisation service for ordinary customers, which joins the Business Customised Sheets as a thing of the past. As well as the Game of Thrones issue early in the year, Royal Mail concluded the Postal Heritage Transport series with two more sets (shipping and bikes) in spring and autumn, but abandoned stamp exhibitions – there were no RM Post and Go machines at either Stampex or Scotex Perth, and there were no new inscriptions at any of the museum locations except for the Postal Museum. This followed the multiple embarrassments to RM in 2017 and the decision to reduce the size of the company's presence at Stampex to reduce costs. The Poppy stamp was reprinted for Remembrance day, and the Winter Greenery set was also reprinted as this year's winter issue. This seems to be the way forward and we have seen nothing in the 2019 programme to indicate that there will be any new Post and Go issues. … provided the biggest amount of news coverage this year. Firstly the dark-coloured 1st class M16L counter sheet stamp (which was elusive even in 2017) finally appeared in sufficient quantities to satisfy most demand. 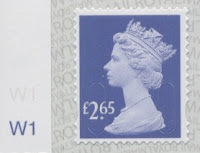 The last M17L coded stamps did not appear until the early part of this year with the 50p available at Spring Stampex. Also available there, but not on the first day (!) was the SBP version of the 100g Special Delivery stamp. Alongside all this Stanley Gibbons catalogue and Windsor album editors at last decided that there were too many sub-numbers in the U-series of security Machins, so did a complete renumbering for the Concise catalogue in late spring. This left dealers processing wants lists based on old and new numbers, at least for a while. But much more interesting things were still to come. We reported three years ago that De La Rue were planning to switch all stamp printing from the UK to Malta (and passports vice versa). At the time Royal Mail knew nothing about this. After intervention by the Maltese government it seems that some passport production was retained on the island. 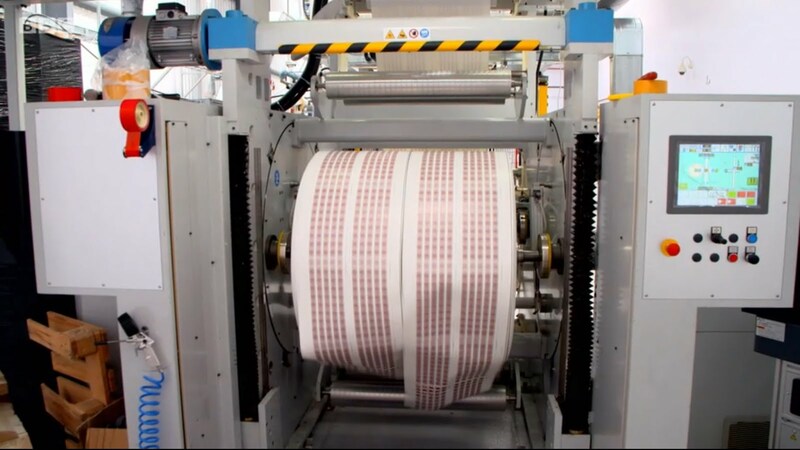 We do know that the RM contract for printing counter sheets was due for renewal: whether DLR did not bid, or whether they were outbid we shall never know, but in March the new tariff stamps were found to have been printed by International Security Printers/Walsall. Before long the existing values soon appeared with the M18L year code, and we found that these too would be printed by ISP/W. 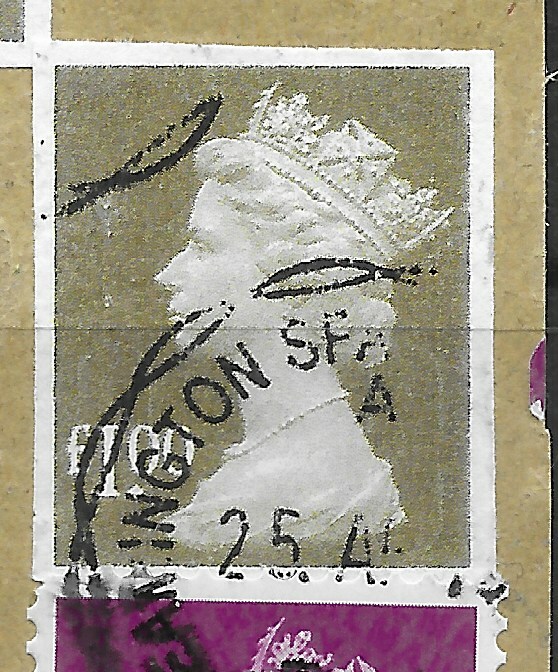 This caused some confusion among collectors and dealers as these new stamps were regarded by Royal Mail's philatelic service as being 'non-visible change (NVC)' and they were duly distributed to customers who had NVCs on standing order (which meant that we didn't need to order as many to sell to our customers). 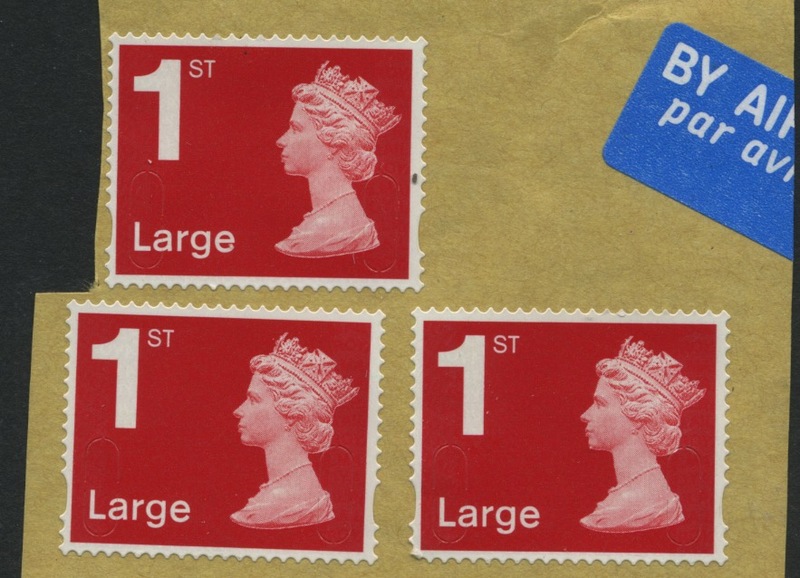 Ironically the much more visible year-code change stamps are not so distributed, so next year collectors and dealers will be back to the same situation as every year from 2010-2017, ie no automatic distribution of new printings of counter sheets by Royal Mail. As some readers know, registered dealers are provided with details of new printings by Royal Mail. With De La Rue printings it wasn't necessary to buy stocks of new printings except for the people who wanted date blocks. All this changed with ISP/W when we found differences in fluorescence or phosphor on later printings: now we have to buy at least a sheet of each to find if there are any differences, and then buy sufficient stock for all the customers who want these variants. The 'watching' season has extended to the whole year! We also found that the Walsall-printed counter sheets are often on thinner paper, making separation more difficult. Late last year I decided, after 20 years of selling online, to call it a day on new Machin definitives – no more after the M18Ls – in order to work backwards. I'll still report new stamps and variants as I get them, as I will be getting them for a couple of friends, but not for stock and sale, as announced here. We are grateful for the many positive messages we have had regarding this move, from customers, other dealers, and readers who are contributors but not customers. Thank you all for your good wishes. We hope you continue to find the blog of interest, and that you find something interesting for your collections on the shop in future as we work backwards and sideways to other material. So our thanks to all our customers, to the readers of this blog and especially to the many contributors. I won't see you at Stampex, nor at York in January, but maybe at Midpex in the summer or another provincial event - or even at our Norwich fairs! Say hello! Our office will be closed from 21 - 31 December: the shop will be open and new stock will be made available from 31 December. We'll process orders as soon as we can. 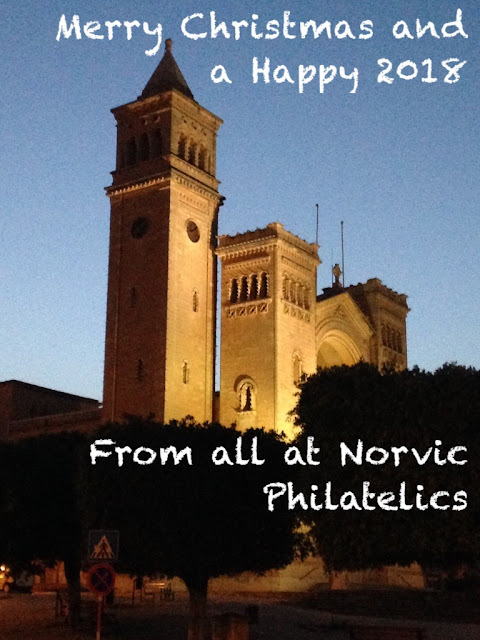 Once again we wish you all a very Merry Christmas and Happy New Year! - and if you don't celebrate Christmas, then we still wish you and your families and friends, happy times whatever you celebrate. ON 4 December we announced that we would not be supplying new Machins after the current year code was complete and promised to provide customers with alternative sources of supply. I am pleased to say that a number of dealers approached me, including one in The Netherlands, and we have a recommendation for a very good dealer in North America. The original post, with list of dealers appended, is now accessible from any view of the blog, at the IMPORTANT ANNOUNCEMENT link lower in the right hand column. Thank you to all those who have written about this decision. I know how frustrating it can be to have to find a new supplier when your preferred source closes or changes tack, whether it is in the high street or online. All the more so if you have come to us having lost a different source. Providing you with this information is a bit of a double-edged sword because, of course, you can probably find at many of these dealers past years' stamps which you want and which we still have, as well as those older Machins that we will start listing next year. We hope our prices will be competitive and if your order doesn't reach our £10 minimum order level, please email us and we will endeavour to reach a conclusion which works for both of us. I don't want to have to use all the stock for postage! We will use this blog and social media to let you know which major groups of stamps, covers, cards etc we are adding to our shop, and we hope you will find something to interest you. Immediately after the holidays we will add the latest printings of counter sheets and the Padlock booklet on SBP1. Finally, thank you all for your good wishes following this announcement. It is good to be appreciated and I hope that those readers (not all of whom are customers) who have provided us with details of new findings on everything GB philately has to offer, will continue to do so in the future. Final 2018 summary of Machin security stamps issued/found in the year. This is unlikely to be the full list of M18L-coded stamps as there are likely to be more reprints early in 2019, and maybe other new stamps, but this is the definitive list for now. The Checklist is being updated but a new version will not be uploaded before Christmas. In this revised table, changes are highlighted in yellow, and variants only seen with a UV lamp are inset so a simplified listing can exclude those. All these, except for last year's 50p and Special Delivery 100g SBP2 which were found early this year, are printed by Walsall. 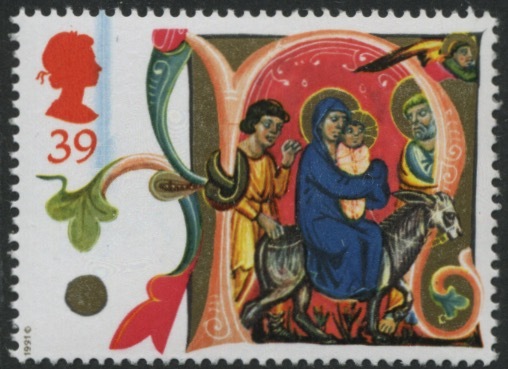 For readers in the UK, or with access to UK television, a small item on BBC television about the design and production of the 2018 Christmas stamps. 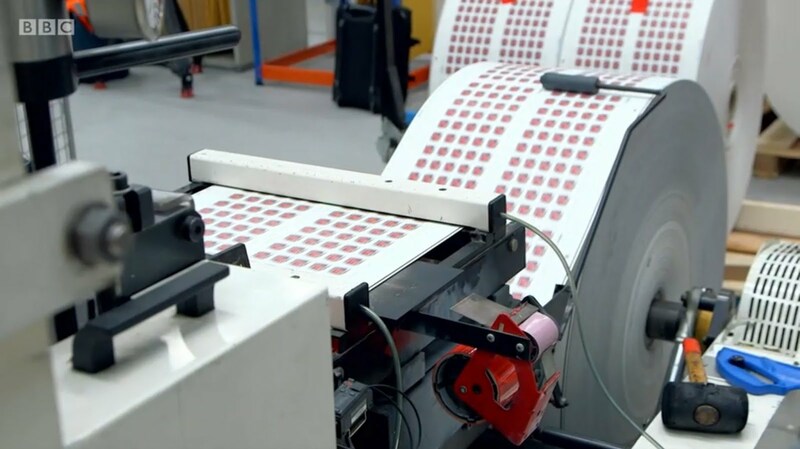 "Inside the Christmas Factory" on BBC Two yesterday had a short making-of feature for this year's Christmas stamps, including a behind-the-scenes bit at ISP in Wolverhampton. You can find it here, but for a limited time only. Here are some screen shots giving a flavour of the design, colour separation, division of master sheets, and perforation. Click on them to see larger versions. I was sent this picture last week, of a piece taken from kiloware. 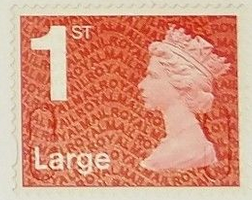 The self-adhesive 1p stamps were carefully placed over the edges of the £1 'stamp'. And yet this was cancelled at the counter at a post office branch in Leamington Spa. I suppose after that, Royal Mail's Revenue Protection team would not pay it as much attention as if it had been on a (non-) machineable letter. I've also been sent a piece bearing 3 (was four) 1st class Large forgeries, easy to see by the absence of year code. Our correspondent says that the gum is not water-soluble (as so many price labels aren't) but the very thin stamp did float off in lighter fuel and the gum went into solution with the lighter fuel, unlike genuine self-adhesive stamps where the gum remains separate. When people can get away with this, it's little wonder that prices have to be increased every year. It is probably still cheaper to surcharge the inland mail that is noticed than to chase all the sellers. I'm sure you remember life before Walsall won the contract to print Royal Mail's counter sheet definitives? 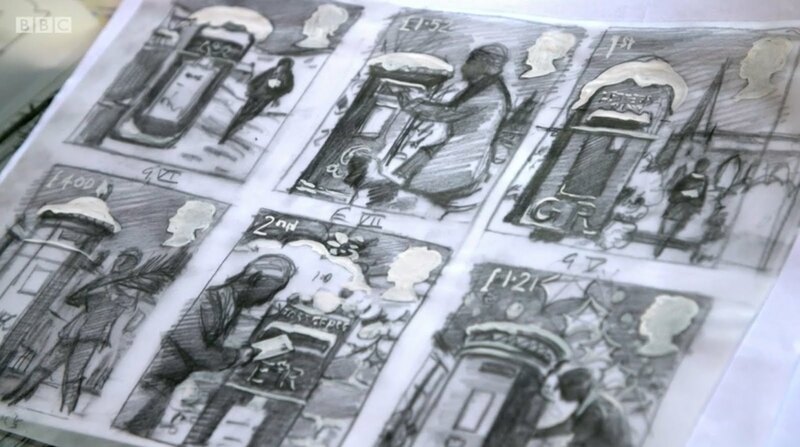 There were just as many printings during the year by De la Rue but they were all the same - well, maybe with slight differences to the brightness or dullness of the phosphor reaction, but most people were not concerned with that. This - indeed the period after Autumn Stampex - was usually a quiet period for Machins, and we could consolidate and look out other things to offer you. What a difference a year makes! The variations in printings by ISP/Walsall have meant that there are up to three different printings and variants for the same stamp, if you want to collect them. Some people are happy with face different. By the way, none of these will be available from our shop until January. We all have far better things to do over the next week than order and post stamps around the world. The latest printings were made known to us at the end of November and our supplies arrived yesterday. The values concerned are the second printings of the 2nd class and 1p stamps, and the third printing of the £1.45 airmail stamp. This was the one that surprised us, you will remember, with the second printing having yellow fluorescence in the dove grey ink, the only stamp so far to have appeared with fluorescence in the colour ink. So I'll start with this. The third printing, on 30/10/18 continues with yellow fluorescence in the dove-grey ink, but also in the transparent iridescent ink! 2nd printing - yellow fluorescence only in dove-grey ink meaning that the ROYAL MAIL pattern stands out clearly with the yellow letters showing through the iridescent ink. 3rd printing - yellow fluorescence in both dove-grey and transparent iridescent ink; the ROYAL MAIL lettering barely shows at all under UV light. The blue phosphor cylinder number is off-picture to the top. £1.45 2nd & 3rd printings compared. And now an apology. The original printing of the 1p maroon is correctly shown (in my stockbook) and on our web-shop as having blue phosphor and yellow fluorescence to the iridescent ink, but our Checklist doesn't mention the fluorescence. This has now been corrected for an edition to be published in January. The second printing, 22/08/18, has only blue phosphor and no fluorescence. Lastly the 2nd class. Surprisingly this is only the second printing for what must be one of the most used values - but as I have mentioned before finding used counter sheet examples rather than stamps coded B or T from business sheets and booklets is quite difficult. The first printing had bright blue phosphor, which we had identified as just 'blue'. This has now been changed on the Checklist as the latest (29/10/18) printing is dull blue, as shown below. The last addition before Christmas (I hope) is the long awaited 6 x 1st Padlock booklet on SBP1. This was first mentioned in October but we didn't have any supplies or pictures. 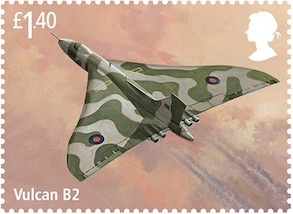 We now have the pictures and the stamps will also be available to buy in January, as 2936aS.8a. When we re-open after the Christmas/New Year break we will also be restocking some of the other recent stamps. By then Royal Mail should have announced to the media the stamp programme for the first half of 2019. In the early years of this blog there were a number of errors in Prestige Stamp Books, notably inverted panes and the occasional overturned pane, and the famous missing gold on one pane of the Victoria Cross book. (search for 'errors' to find these. But we have a new one as this year comes to a close. 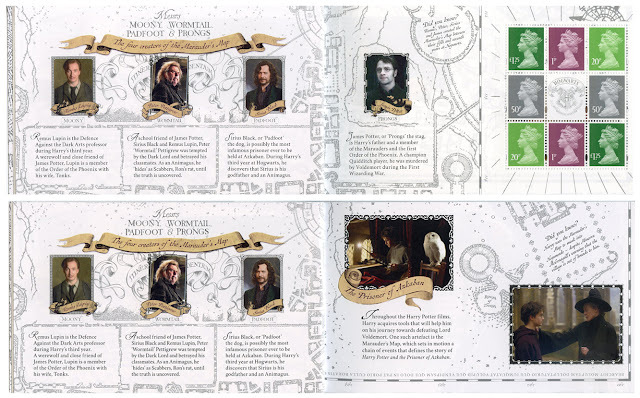 As I indicated here, the Harry Potter prestige book can be started from either end, half the pages inverted in relation to the others, presenting two stories. The two miniature sheet panes are facing each other, which is another problem for the printers assembling the sheets. 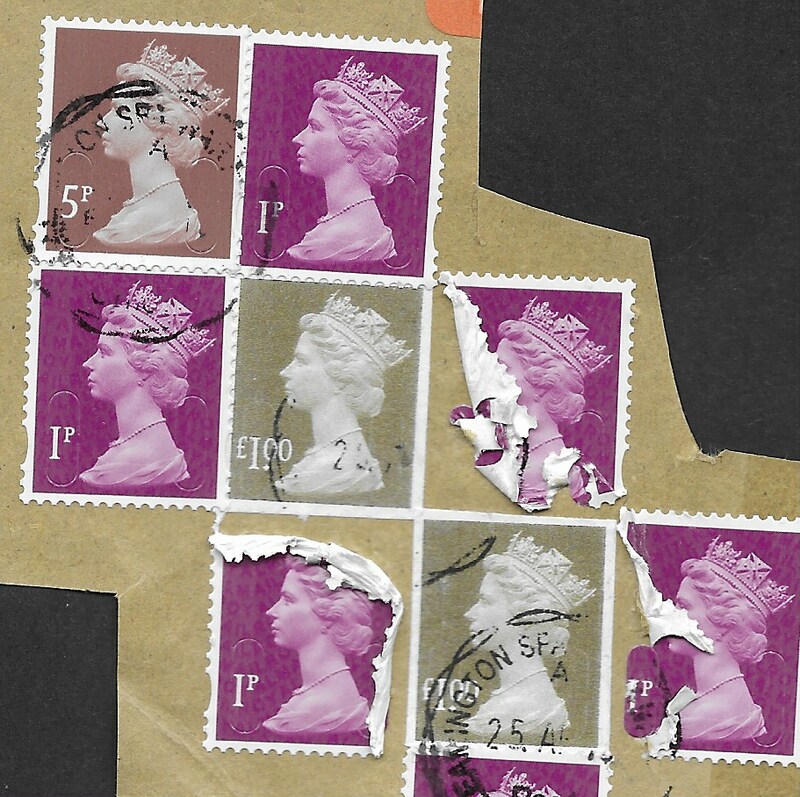 In this picture the back cover is on the left behind the pane with three stamps. Members of the Modern British Philatelic Circle will find this in their next auction. Update 7 December : As JG writes,"It seems that ISP have had more problems than usual in assembling the Harry Potter PSBs." Well, I suppose the make-up makes it more difficult. Because the individual pages are from sheets, it's not like printing a magazine or newspaper that starts from both ends. 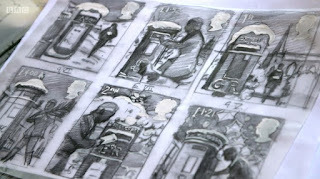 In that case the pages are set onto the plate that way before printing starts (usually on the web). JG's example has pane 3 missing - not torn out, just never put in. A good variety even if it did cost more than the value of the stamps it includes. (We are still waiting for a picture of the example with double cover (see comments). 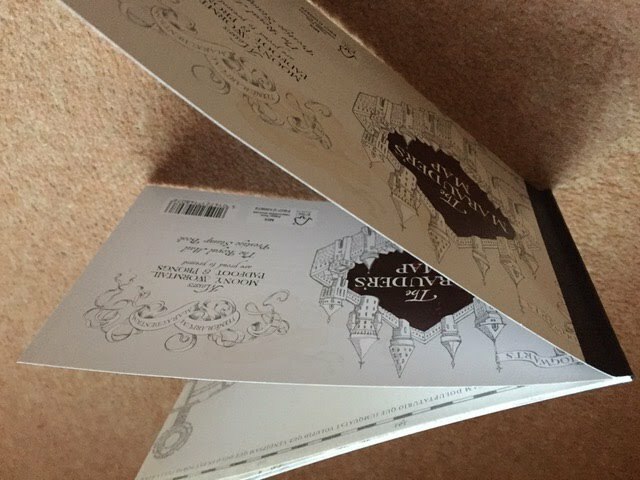 UPDATE 11 December: A second correspondent (thanks KC) has sent a picture of his PSB which also has two back covers - not easy to photograph, but quite clear in this picture. UPDATE 19 February: A friend of mine went through some stock on the Royal Mail stand at Stampex and found these two errors, one with a duplicate pane, and one with the same pane missing! For earlier PSB page errors, see here. Today we are announcing a major change to our business. This further change will give me more time to spend on my own collection, and finding a way to dispose of the decades of accumulated stamps and postal history without buying any more! It will also give us more time together, on holiday, which is as it should be in the eighth decade of your life! One consequence of this, which I have alluded to in some email exchanges, is that we will not stock Machin definitives after the M18L stamps, ie none of the M19L codes or later. To clarify, if there is a PSB in early 2019 containing M18L stamps, we will supply this but not any later ones. I am sorry that this will come as a disappointment to our existing customers, some whom we have been supplying for some years, and quiet a few who have only recently joined us.. The blog will continue to provide news of Machins, slogan postmarks, and other British news. It will also be used to tell you about additions to our e-commerce shop (of which more below). The Machin Checklist will continue, using information from many people as at present. There are several reasons for this, mainly personal. For those who don't already know, I turned 70 in April this year. In itself, that isn't a problem, as I am blessed with good health, and a good wife (Val) who keeps me properly and healthily fed. We know from our World Tour in late 2016 that the world can manage without us, and the business has continued as if that never happened. Meanwhile John takes on all the technical stresses of the business. We have boxes and boxes of ‘stuff’ here that we don't want to leave for John to sort out in 20 or 30 years time (see, I'm optimistic). There are stockbooks of older Machins, some Wildings and many commemoratives, and first day covers; many foreign & commonwealth stamps; boxes of postcards mostly for their postal history side, and boxes of postal history from around the world. The sooner we can get these on our shop or eBay, or dispose of them through other outlets like Stampboards.com, the better it will be – and I will find all manner of things I had forgotten about! I don’t know what I will get to first. I will probably start by listing older Machins, regionals, pre-security booklets, etc, but I also have several hundred postal history covers already scanned, so some of those will be listed early on. There is also a practical difficulty. 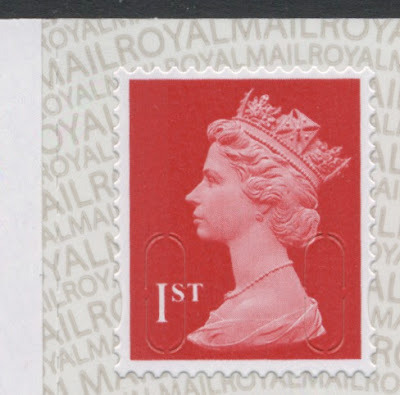 As you know Royal Mail Tallents House do not routinely supply definitive stamps with new year codes, nor singles from booklets or business sheets. They departed from that in 2018 by supplying the counter sheet stamps from the new printer. But aside from that stock provided by Royal Mail most of the new stamps we sell have come from one or two local people who scour the post offices and retail outlets, and are often the first to discover new stamps. Now that more Crown and directly managed Post Office branches are changing to franchises in WHSmith and other retail chains employing their own staff and using self-service kiosks, the volume of new stamps ordered by those branches for sale to customers will decrease, making the hunt more difficult. There are many other dealers selling new Machins as they appear, on a combination of their own websites, eBay, at fairs or simply by mail order on their lists. I don’t intend to make any recommendations although I am compiling a list of other dealers. There doesn’t appear to be any website using the same platform as we do, so layouts, provision of images, etc, will be different to what you are used to. But some of you are already using several dealers. I will be interested to know of other dealers that you can recommend, especially outside the UK as this may assist our customers in, especially, Australia, New Zealand, Canada and the USA. I will supply details of other dealers on request only with comments and contact details. This will follow as soon as possible. An updated version of this post, with dealer details is now shown here, listed in the right-hand column for easier access. If any other dealer reading this wants to ‘pitch’ for business with our existing customers I will include their submission within those details, making it clear that it is their pitch rather than my comments. The One Post Office website reports changes to screens on self-service kiosks in Post Office branches are now being rolled out. Customers and Christmas Makers will see some changes when they use the Self Service Kiosks this festive peak. Many of the screens have been updated with a simpler, more user-friendly and visual layout to make them easier for customers to use and to find the transaction they need. Post Office Broadband & Phone bill payments have also been added. We’re introducing these improvements thanks to feedback from branch colleagues and last year’s Christmas Makers. The changes are rolling out to all branches with SSKs between today (Tuesday 27 November) and Thursday this week. There is now a cash payment button on the payment screen as well as the debit and credit card options. The first December postmark actually starts in November as already reported, with the Post Early for Christmas slogan. So that's a start. Another example of the first layout would be useful, and later there will be specific slogans for 1st & 2nd class inland posting dates. And thanks to DF & RW we have two examples of the reversed slogan applied to square envelopes when the stamp is identified as being in the 'wrong' corner, one from Cumbria and the other from Plymouth. UPDATE 8 DECEMBER: Thanks to BM and JG for the latest batch of slogans which includes one for the NHS 'Staywell' campaign. Glasgow 05-12-2018, Southampton with logo 07/12/2018, Edinburgh 05-12-2018, Birmingham with logo reversed 06/12/2018. Meanwhile Gatwick MC is still using Movember for it's reversed slogan on 06/12/2018. And here's a lovely square card envelope from Gatwick Mail Centre: cancelled on 8 December with the ordinary position of the Movember slogan (no logo) which missed the stamp - this should have been reversed so as to hit the stamp; but it was delayed and processed again on 9 December with the Staywell slogan! 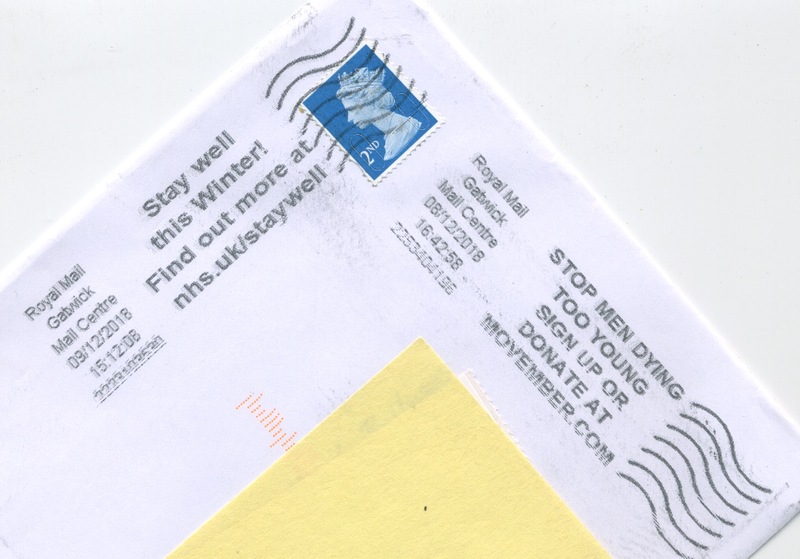 13 December: Nice to see that Tyneside MC is catching up (see previous monthly reports), and is now showing the Staywell slogan, here reversed on a square card, 8 December. Update 20 December: Now that we have a better copy of the slogan with the logo, we can see the alternative layout of the slogan. This from South East Anglia on 19 December, with all text the same size. 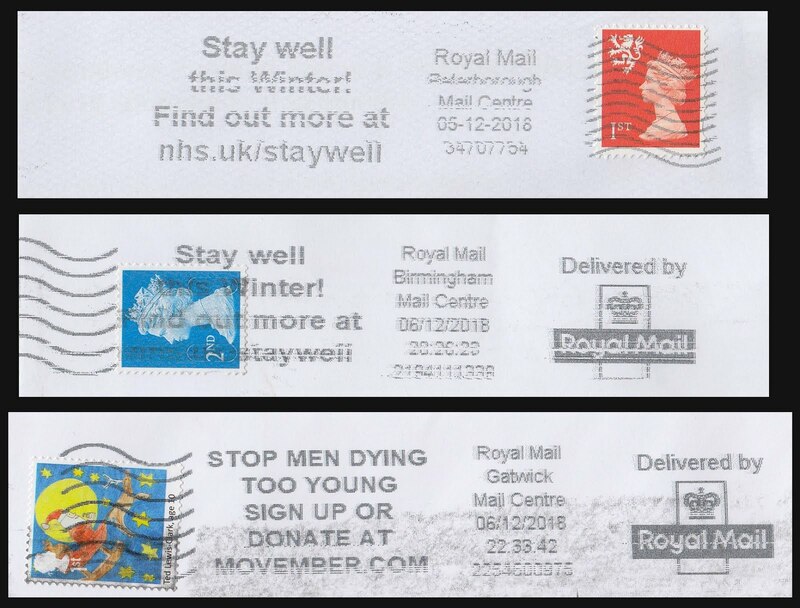 By 20th December, ie too late for the Last Posting Dates slogan, at least some Mail Centres were back using the default Action for Children slogan, thanks to BM for these. Remember also that there are still some Universal machines in use, or pressed into use, which may have old slogans. We would be interested to show all of these as well. and they will be useful for the British Postmark Society records. UPDATE 7 December: Surprisingly, the first Universal impression this year comes direct to us from Jubilee Mail Centre (I can just make out the JUB on the right of the datestamp), used on 5 December. UPDATES 13 & 17 November: Norwich can be added to the list of offices pressing the Universal/CFC machine into use, albeit with the outer slug inverted, but the date (7 XII 2018) upright. Also Peterborough SCM3 - with year but no date & month. Another update 17 November. Just as the Peterborough one was added, another email from MB showing the Snowman Happy Christmas PLEASE POST EARLY from North & West Yorkshire -3- dated 13 December 2018. JANUARY UPDATE. This usage from Swansea & South West Wales on 2 January 2019 was reported on the Stampboards forum. This has been repeated in a new post for January Slogan Postmarks. UPDATE 2. This has to be the most bizarre piece ever shown in the postmark threads. The postmark on the left is about as good as mine from Jubilee, and is from Lerwick - you can see the CK. This was posted on 1 December, a nice clear date. It then got reprocessed in Edinburgh, again with a CFC1 Universal-type postmark! And one on which they hadn't changed the date slugs since 30 VII 2017!! Thanks to JG for this one. I received this in the post last week, and thought that it was an odd slogan. But then I realised that the God Jul slogan came from Kastrup in Denmark, despite the obvious Royal Mail 'ghost' slogan.